When I ask Hannah what she wants for lunch she ALWAYS says, "Pean budder jelly". So for lunch she gets peanut butter and jelly sandwiches! I do switch it up on her now and then but I can usually count on a clean plate when I serve her PB&J! Typical toddler, eh? I am always trying to find ways to get healthier things into her diet as she does not eat veggies. Believe me...I am creative. I buy the strawberry jelly with the real strawberry pieces in it...and as for peanut butter, I usually buy what ever is cheapest. :( So, she isn't getting the best when it comes to that. I do try...but it isn't easy! Along with her PB&J sandwich, I give her yogurt with honey and she LOVES yogurt! Feeding her good food is a battle, but when I win it is well worth it! Tropical Traditions has been a favorite company of mine since I have been doing reviews. They have some of the tastiest and healthiest products that I have eaten and the best part is, they are SO healthy! So, when I was offered another opportunity to work with Tropical Traditions, I chose to review their Organic Coconut Peanut Butter...although there were so many options from which I could choose! 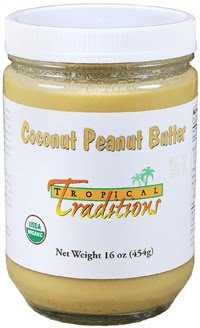 Tropical Traditions Organic Coconut Peanut Butter is made from organic peanuts and organic coconut. Two ingredients: nothing else! No fillers, no binders, no sweeteners, and no preservatives. The peanuts are 100% organic Valencia peanuts grown organically by family farmers in New Mexico and Texas. Grown in the dry climate of the southwestern United States, these peanuts are certified organic and free from aflatoxins. The dried coconut is certified organic coconut meat from the Philippines from coconuts that are grown with no fertilizers or pesticides. This premium dried coconut contains no additives or preservatives, and is not sweetened. Unlike most dried coconut on the market, our dried coconut products are not treated with sulfites to keep them white. Together, these premium organic roasted peanuts and the premium organic dried coconut are ground together to make a delicious and nutritious spread! For this review I was sent a 16 oz jar of Organic Coconut Peanut Butter from Tropical Traditions. I was very excited to try this peanut butter as we eat alot of it here in our house! I was also very interested to see how the coconut tasted combined with the peanut butter. This Organic Coconut Peanut Butter is not hard to spread, which was suprising. It looks dense in the jar but is really soft! I tried it on some bread and it is VERY rich...which was good! I came to the conclusion that I had put too much on my bread...LOL! But, in all honesty, it was very yummy. My daughter also really enjoyed the samples that I gave her as well...which is a HUGE plus! Tropical Traditions provides some really good looking recipes on their site, which I am very anxious to try. This Organic Coconut Peanut Butter should make some tasty baked goods for us! So, in my opinion, Tropical Traditions Organic Coconut Peanut Butter is a really delicious product! I was impressed by the denseness, sweetness and spread-ability of this peanut butter. The flavor is rich and the texture is creamy. My family will benefit greatly from this product...I am so thankful for the option to serve them organic over store brand! Visit Tropical Traditions and tell me which product interests you the most. You do not have to be a blogger to enter, but you must have a valid email where you can be reached should you win. If you do not leave an email address, it must be where I can easily find it. This giveaway is open to US residents (one account per household) and will end 4/20 at 11:59 pm EST. The winner will be chosen using random.org and will be notified by email. The winner will have 48 hours to respond, or another winner will be selected. 7. "Like" our photo on UPrinting's Facebook Page (you may have to "Like" Uprinting first). 2 entries, so 2 comments..
Disclaimer: I received no monetary compensation for this post. I received Tropical Traditions Organic Coconut Peanut Butter for review purposes. All quotes are from the Tropical Traditions website and email. All thoughts and opinions are 100% mine. I love many of their products, but this Organic Coconut Peanut Butter sounds heavenly! I'm a friend on GFC! I'd like to try the Coconut Chips. The organic dark chocolate interests me most! thanks for this YUMMY giveaway! I like the organic flaked coconut. I'd like to try Tropical Traditions Coconut Flour in the experimental baking of macaroons. Organic and gluten free. I'd also like to try the Coconut Cream Cocentrate. There are some interesting recipes for it. I've been reading so many great things about Coconut Oil lately, so I'd have to go with that! I would be very interested in the Tropical Traditions Organic Palm oil shortening! I follow @coupons4moms on Twitter. My twitter name is foodhistorian. their organic dark chocolate - yum! I'd love to try the coconut cream concentrate! the coconut chips look good too, mmm! I would love to try the Classic Teeth Cleaner. The Coconut Chips look very tasty! I follow Tropical Traditions on Twitter under the username likwan. I follow Tropical Traditions on Facebook under the username likwan. I'd like to try their coconut flour.